It took me awhile, but I've finally got pictures from halloween stuck on this here computer machine so's I can share 'em. Personally, I don't imagine that the kindergarteners would have been too excited to do much with the day if they hadn't been encouraged to come in constume, party, and parade. Me, I'd have been in some sort of sugar/excitement induced coma by noon, but as you can see here this did not appear to be the case for the brave mermaids, princesses, superheroes and vampires of Ms Mena's class. Elise was a mermaid, as was her BFF. The kids were all so cute. First, we were treated to a wonderful singalong. 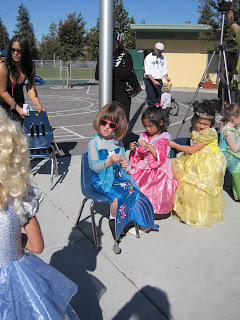 Then, the classes took turns parading around to show off their lovely costumes. Being wrangled by the flamingo in charge, Ms Mena. Up next: Halloween at home and around the neighborhood!